A victim of Brigham Young's hitmen. BETHLEHEM , P A ., April 14, 1857.
favor upon us by giving us the particulars of such information as you have gleaned. You can better imigine, than I can by words express, the feelings that thus influence me to impose this much upon your time. CHICAGO , I LL . , April 27, 1857 . MRS . M. D. GUNNISON. , Bethlehem, Pa.
MY DEAR STRANGE FRIEND : -- Your kind note of inquiry, under date of the 24th inst., was duly received at this place on the 21st inst., but owing to personal matters, I have been wholly unable to reply to your letter until this day, for which delay I trust your generous heart will find no fault. You ask me "to give the particulars of such information as I have gleaned" in connection with the murder of John W. Gunnison, who was most foully and inhumanly murdered on the Servier river, in Utah Territory, in A. D. 1853. This information I will cheerfully give you, not only as a sense of duty to you as the wife of a good man, who fell prematurely at his post doing duty, but as a matter of fact, which should go to the world as a portion of the history of that barbarous transaction. In the month of November, A. D. 1853, Captain Gunnison and eight others (one of whom was a Mormon), were murdered on the Sevier river, in Utah Territory, and the report was quite current that they were murdered by the Indians; subsequently, at a session of theGrand Jury in Juab county, Utah Territory, Hon. John F. Kinny, presiding, twenty-six Indians of the Parvante tribe were indicted for the said murder, and, by some arrangement between Col. E. J. Steptoe, of the United States Army, and Kanash, the Chief of the Parvante tribe, eight Indians (some of whom were squaws, and one old blind Indian man,) were put upon their trial for murder, at Nephi City; and strange to say, a Mormon jury found the Indian warriors not guilty, and as against the old, crippled, and measureably blind Indians, three in number, found a verdict of manslaughter, and they were sentenced to three years imprisonment in the penitentiary of Utah, being the full length of time prescribed by the statute for such offences. These verdicts, and the finding of the juries under the law and the evidence, so wounded and mortified Judge Kinney, that he at once adjourned the court, unavoidably coming to the conclusion that there was false dealing somewhere; and in fact, not only he, but Col. Steptoe, Gen. Holman, and the Government Attorney, Hon. Garland Hurt, the Indian Agent of the Territory, Capt. James B. leach, the mail contractor between San Diego in California and Salt Lake City, and Columbus L. Craig, all of whom were cognizent of the influences brought to bear on the trial, arrived irrestibly at the conclusion that the Indians were found not guilty by order of the church, and that Dimick B. Huntington, an Indian interpreter, and spiritual brother-in-law of Gov. Brigham Young, was the man who bore the decree and order of the church to the jury, who implicitly found the verdicts according to the mandates of the church, as is now the universal rule and order of jury trials "in the peaceful valleys of the mountains." 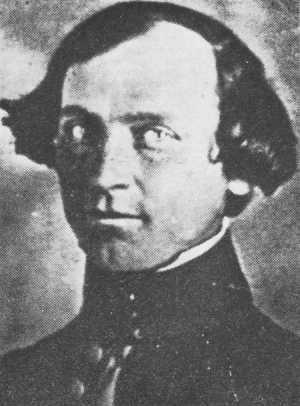 At the November term of my court, held at Fillmore City, in the year 1855, one Levi Abrams, a Jewish Mormon, was put upon his trial for the wilful and unprovoked murder of Toebe, a favorite warrior of the Parvante band, and during that trial much was said by both Indian and white witnesses relative to the murder of Captain Gunnison and his party, which raised strong presumptions in my mind that certain white men were particips criminis to that cruel murder, but not wholly conclusive. In this case the jury, true to the law of the church, and basely false to the law of the land, found Abrams not guilty. At the same court, a favorite Indian warrior of Gov. Young, by the name of Eneis, was put upon his trial for the murder of Captain Gunnison and others, to which I particularly allude in this letter and at this time, and, upon his trial I became convinced beyond the possibility of a doubt, that the whole affair was a deep and maturely laid plan to murder the whole party of engineers, or surveyors, and charge the murders upon the Indians (who, by the way, have the credit for killing a great many persons). In the trial of the warrior Eneis, the evidence disclosed the fact that he was the property of Governor Young, and that he could speak English quite fluently, and that, when he left the city of Salt Lake, he went under the order of Governor Young and the church. Again, it was repeatedly proven that Eneis was in company with several white men on the day before the murder, and that they were all on their way toward the engineers' camp. Again, it was proven on the same trial by a number of Indian witnesses, that only four shots were fired by the Indians, and that all the rest were fired by the Mormons, and that, by order and direction of the Mormons, the Indians sprang out of the ambush, where they lay disguised during the night before the firing, which occurred about sunrise in the morning, and went across the river to scalp and otherwise maltreat the men in their agonies of death, but more particularly to save the Mormon who fell in the fight, provided he was not fatally wounded, and told the Indians how they could recognize the Mormon from the Americans, which was by certain peculiar marks on the garment which he wore next to his body; but the poor fellow, with the other eight had received a fatal shot, and died on the ground with his priestly robe worn next to his body. The white men were so accurately described, that any one acquainted with the principal men of the Mormon church could quite readily select the men described by Old Pareshont and Heap of Elk, as well as several others equally as honest and intelligent, who were the principal witnesses in behalf of the Government. And right here I have no hesitation in saying who some of them are and were, and this I do for the benefit of those men who may go to Utah as appointees under the present administration, viz. : William A. Hickman, Anson Call, Alexander McRay, Ephraim Hanks, James W. Cummings, Edwin D. Wolley, George Peacock, Levi Abrams, and ______ Bronson, all of whom are in good fellowship and standing to this day in the church; and although the evidence on behalf of the Government against Eneis was clear and conclusive, and no rebutting evidence, the Mormon jury, true to the order of the holy priesthood, found a verdict of not gulity. And here, my dear friend, painful and revolting as it is, the true history of that sad scene requires me to say that the evidence disclosed the fact that several Indian warriors crossed the Sevier river immediately after seeing that they had accomplished the work for which they were set apart, and proceeded to cut off the legs and arms of the men while in the agonies of death; also, to scalp them, and then rifle their pockets of their contents; and take off their clothes and put them on themselves; and that Eneis, the then prisoner at the bar, cut Capt. Gunnison's body open and took out his heart while he was yet alive, and the heart full of blood that it bounded on the ground after being taken out; and not content with this, but cut out his tongue, and otherwise cut and mangled his body. True it is, my dear friend, I know that this dark and bloody picture will prostrate every nerve of your tender form; and painful and heart-sickening as it is for me to think of, let alone pen anything in connection with that revolting murder, but duty to you, duty to the country, duty to a broken and violated law, duty to bleeding and down-trodden humanity, duty to a correct history in connection with the dark and bloody code of the order of the High Priesthood of the Utah Mormons, and above all, duty to the fair reputation of a brother officer engaged in the faithful discharge of his duty, and one who fell in the noonday of life at the hands of an organized band of systematic pirates, robbers, and murderers, and whose blood yet cries to heaven for a witness to attest in thunder-tines the dread but sad and solemn truth connected with his tragic fate, all seem to require that when I answer his wife, the companion of his youth, who so naturally applies to the man, of all others, possessed of the legal truths connected with this history, and I hould tell them precisely as they are, and not suppress any part thereof. I can well imagine, Madam, your long sufferings and anxieties relative to the death of your husband, and I most truly assure you that your conclusions relative to his death were well founded. I leave you and all others to conclude whether I am not fully justofied in my conviction in the premises, and whether I could have rationally come to any other conclusion than the one to which I here refer, as well as in my letter of resignation to Attorney-General Black. With an ardent desire that you may live to a ripe old age, enjoy all the blessings which this life can afford, and, above all, in that list of blessings, good health, live to see the day when the foul stain of Mormon oppression and tyranny shall be effectually checked in this our happy country, your husband's untimely death vindicated by the courts and laws of the land, and, after death, in that Grand Lodge above be re-united to the partner and companion of your youth. * The above senstional correspondence between the widow and the federal judge was printed in the New York Times on May 1, 1857 setting off a national public outcry. The Morman Murderers Identified in Federal Judge William W. Drummond's letter were: William A. Hickman, Anson Call, Alexander McRay, Ephraim Hanks, James W. Cummings, Edwin D. Wolley, George Peacock, Levi Abrams, and ______ Bronson. For more information on this Massacre read Salley Denton's book American Massacre. Here is the LDS cover-up of the Gunnison Massacre. It is amazing how the Indians were always to blame.